SWLA has completed a small garden for a house in Diamond Heights. The house is sited on a hill and has expansive views of the city and the bay. In contrast to the upper floors, the lower level looks out into a small yard that is enclosed by adjacent fences and homes. The yard is anchored by a large pine tree that frames the views from the upper stories of the house. The garden was designed to enhance the Zen-like character of the pine tree. Paved with crushed granite, the garden is enclosed with new walls of Ipe and perforated metal panels that screen the neighboring properties and unify the space. 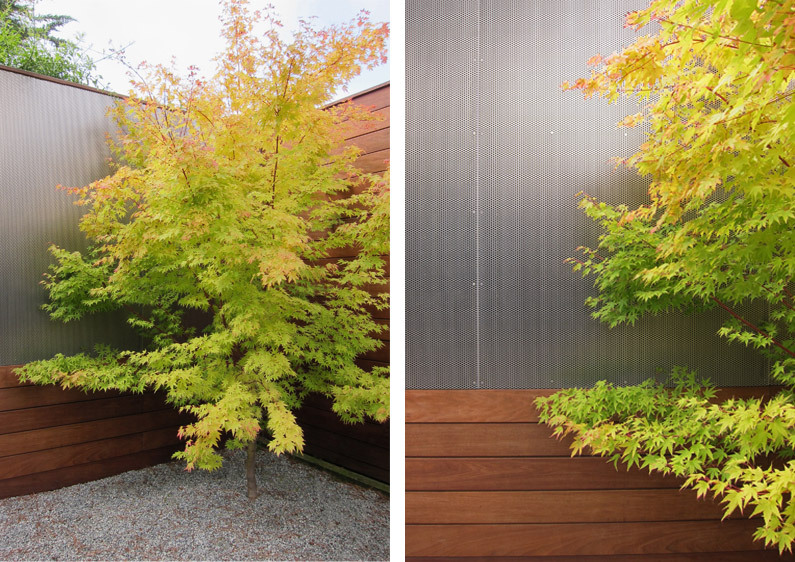 The rich color of the Ipe complements the cool glow of the metal panels and together they provide a handsome backdrop for the new specimen Japanese Maple.